Every year, Americans eat about 3 billion pizzas, with the average person chowing down on 46 delicious pies per year. Pizza is obviously one of life’s greatest joys. Why not combine that joy with the fun of celebrating a birthday? If you are throwing a party, you can’t go wrong with a pizza theme. Delicious, cheezy pies are naturally the main dish, but you can do so much more with the theme. Pizza party planning doesn’t have to be hard. Learn how to take the pizza theme to the next level with tips on the invitations, food, decorations and party favors. No birthday party is complete without friends and family there to celebrate. Invitations offer a fun, creative way to show off the pizza theme. Pizza parties are popular with good reason. People love the food and the fun. So, it should be no problem to find invitations for the big day. You can go out to a local party store and browse their selection of ready-to-go invites. Buy as many as you need and address them at home. The birthday boy or girl can help you fill out the names and addresses of their friends. If you are looking for a little more customization, there are plenty of online options for picking out or designing invites. You can pick out a premade template, or choose everything from the font and colors to the size and shape of the invitation. If you have any crafty inclinations, party invitations are a good excuse to break out the paper and glue. Browse online for inspiration. Some simple construction paper can easily be cut into triangle slices, while different colors can be used to make the toppings on your invitations. If the party is for a younger birthday boy or girl, the guest of honor can have fun cutting up the paper and putting together the invites. If you don’t want to start from scratch, you can find and print an online template that will help you put together the invitations. If you want to be a real party pleaser, include a pizza toppings survey on the invite. This way you can find out what type of pizza guests are craving and know about any preferences or allergies ahead of time. The invitations, the favors and the fun are all important elements of a pizza party, but the food is what really gets everyone excited. Plan out your menu ahead of time to make sure everyone has their fill of savory and sweet pizza party treats. When you have your guest headcount, you can start to plan how many pizzas and flavors to have at the party. First things first — what is the birthday boy or girl’s favorite pie? Make sure you have at least one of their favorites on order. Maybe he loves stuffed deep dish pizza. Maybe she loves classic thin crust pizza. Next, think about toppings. Picking at least a few different options will help cover all of your bases. Plain cheese will be a hit with nearly everyone, plus it will fit the bill for any vegetarians at the party. You can also order a pie with veggie toppings. Meat lovers will go crazy for pepperoni and sausage. Finally, how much do you think everyone will eat? You don’t want anyone fighting over the last slice. Pizza is the main dish, but you can always put more of a spread out for your guests. One option is to make a dipping bar for those slices. Line up some savory sauces, like ranch, sriracha or barbecue, that guests can spoon onto their plates. Add a veggie platter or French fries for even more dippable foods. Other classic pizza side dishes include garlic bread, pasta and salad. Side dishes can be an excellent way to make sure any guests who can’t eat pizza still get to have a full belly at the party. Pizza-themed party decorations are your chance to go all out with the theme. You can make the party venue look like a classic pizza kitchen or simply put up pizza shapes everywhere you can. Balloons are a classic birthday party staple. If you want to keep it simple, you can buy packages of balloons in red, yellow and orange. The color scheme will fit right in with the main dish and the theme. If you want to be a little more creative, you can tie the balloons together in a triangle shape to make pizza balloons. Party stores and online outlets also sell balloons shaped and colored like pizza slices and whole pies. Blow the balloons up yourself, or have them filled with helium so they float. In addition to pizza balloons, you can buy lettered balloons to spell “pizza.” Choose whatever colors the birthday boy or girl likes or stick with the red, orange and yellow theme. You can also get letter balloons to spell out the guest of honor’s name. Pizza string lights are an inexpensive way but unique way to decorate for your birthday party. These lights are easy to find online or at a local party store. The brightly lit slices can be hung up on the wall, draped along the gifts table or even placed along the baseboards on the floor. If you decide to decorate with these, be careful they aren’t going to trip any of your guests. Secure the tasty-looking lights with tape or drape them in a place that no one will be walking. The lights will lend a cute, cheery glow to the party. Afterward, you can keep the lights as a fun holiday decoration or for any future pizza parties you throw. Plates, cups and napkins are essential pizza-themed party supplies. Pizza may be finger food, but your guests will need plates to eat off, napkins to clean up and cups for whatever drinks you will be serving during the party. Paper plates, cups and napkins are a practical, eco-friendly option for a birthday party. Plus, you can find all three with pizza colors and imagery. Pick out your favorite options from online sellers or a local party supply store. Your guests will be delighted with the playful pizza-patterned supplies they can use throughout the entire party. While you shop for these supplies, you can add other options, like streamers and tablecloths, to your cart. 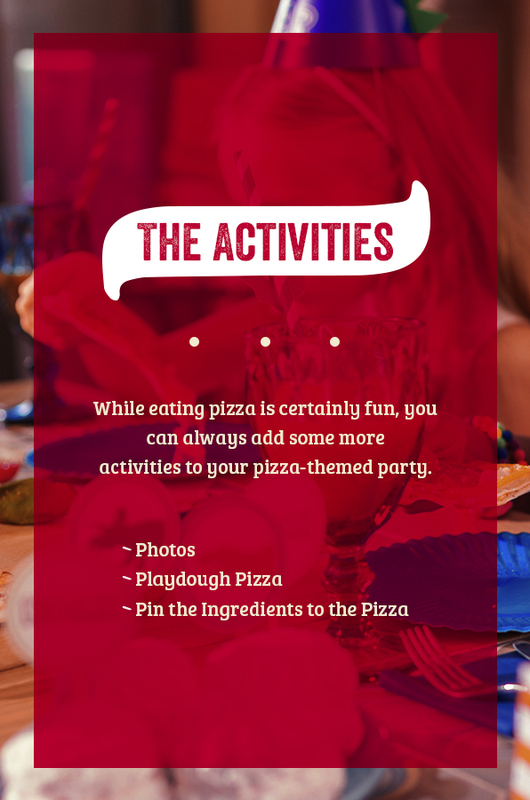 While eating pizza is certainly fun, you can always add some more activities to your pizza-themed party. Here are a few entertaining options to consider. Create a photo booth to help capture the memories made at the pizza party. Setting up a photo booth can be simple as pinning up a backdrop and laying out some props. Feel free to play around with just how the backdrop looks. Try a solid color, or patterns that fit in with the pizza scheme. You can find props to use around the house — take a look in your kitchen drawers for inspiration. You can also see what party stores and online sellers have to offer. Cute word bubbles — think “yum!” or “pizza” — always help get people laughing while they snap a shot. People can also pose with the delicious slices they can actually eat. You can bring a camera to take photos, or people can take turns snapping shots on their phones. If you want to have a pizza-themed game at the party, this variation on pin the tail on the donkey will be sure to entertain your guests. Swap the donkey for a pizza. Blindfold your guests and see if they can pin different ingredients to that pie. You can make the pizza and ingredients as big or small as you want. This can be another DIY project involving construction paper and scissors. The birthday girl or boy can help you create their favorite toppings and the big pizza. Just like with your invitations, you can also go online to find a printable template. Set up a point system to determine a winner, or simply play for fun. You can hand out small prizes for the winner or for anyone who plays. A playdough pizza station is a great option for a birthday party with younger guests. Set up different kinds of playdough and cookie cutters. Invite the party guests to make their own mini pizza and toppings. This will give kids a chance to show off their artistic skills and give them something to do with their hands before and after eating. You can have a pizza-making contest or a game with prizes, or you can give kids free rein to explore their playdough skills. The playdough pizzas also make a great prop for the photo booth. Make sure to keep an eye on guests who might be tempted to eat the playdough pizza before the real thing is served. Party favors are a fun prize for games and a way to thank your guests for coming. Here are a few pizza-themed options that are sure to thrill your guests. Paper chef’s hats and aprons are an adorable party favor option for younger party guests. Children can have the thrill of dressing up for the party theme, while adults will love taking photos of the little chefs. If you have a photo booth, make sure to get a group shot with everyone in their party gear. If you are throwing an adult pizza-themed birthday party, you can opt for higher quality cloth aprons as prizes for games you play during the party. The winners will love going home with something they can use in their own kitchens. If you want to send all of your party guests home with something they’ll enjoy and use, socks are an inexpensive option. Since so many people love pizza, you will have no trouble finding socks with a pizza print. Set up a basket or box near the exit point of the party, so every guest remembers to grab a pair on their way out. If there are smaller partygoers and adult guests, pick out socks for smaller feet and adult feet. Everyone wears socks, and this silly pair will remind them how much fun they had at your pizza-themed birthday party. Throwing a birthday party means there is going to be a lot of food. You’ll inevitably have some food left over. It can be a hassle to pack up all of that food and have it in the fridge at home, but you won’t want to waste it. Portability is part of pizza’s appeal, so enlist your guests in helping with the leftovers. Pizza still tastes delicious the next day. Set out to-go boxes so party guests can take a few slices of their favorite pizza home with them. If they don’t have room for dessert, they can also pack up whatever sweet treats there are at the party — whether cupcakes or dessert pizza — to enjoy later. You can buy your to-go boxes ahead of time, or you can ask your party venue if it has any boxes you can share with your guests. Make life and pizza-themed party planning easier on yourself by hosting the birthday party at your local Giordano’s event space. Our event spaces offer plenty of room for birthday celebrations, whether for kids or adults. Don’t worry about waiting for delivery to feed your hungry party. We will bring the piping hot pizza right to your table, and we will take care of all the cleanup afterward. All you have to bring are the decorations, sweet treats, party favors and, of course, the birthday boy or girl. Make the next birthday party a delicious one at Giordano’s.